Ntokozo Ngcobo (28) has been in the entertainment industry for more than nine years. 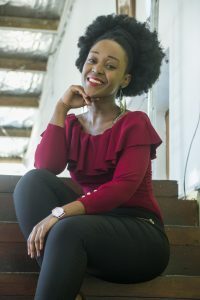 making a name for herself as a poet, motivational speaker, actor, presenter and singer. The returning Dim-Dep cast member believes this year’s production will “be bigger and better” and will leave the audience wanting for more. Dim-Dep: Faces of Environmental Success debuts in June. She portrays the reincarnation of Mpume Mngoni in the 21st Century. Ngcobo said awareness about such productions needs to be raised. “They educate, inform and are practical, because it shows that it is not only developed countries that are able to take care of the environment. This type of productions requires community participation to get the message across. The message is clear that whether you are from a rural area or the townships, the earth is ours and it is up to us to protect it,” said Ngcobo. After studying journalism at Varsity College Ngcobo decided entertainment was her main passion. She trained at the Playhouse Theatre Company and her big break into the industry was in 2009 when she was cast in her first professional theatre production in the United Kingdom. Ngcobo performed at the Arts and Cultural Diversity Expo in 2009 under the wing of Alex Wallace. Other productions she has been involved in include Athol Fugard’s Hello and Goodbye and My Children, My Africa as well as Full Circle and films include Umcebo Kababa and Fun Few Nights. Apart from theatre she has worked with musicians including Zahara, Mzwakhe Mbuli, Musa Sukwena, Chicco Twala, and the late Robbie Malinga, Mafikizolo, Kelly Khumalo in 2013 in the Stop Xenophobia project. When she is not performing she gives motivational talks at schools. “Although the production does not run for the whole year, I still raise awareness about the message Dim-Dep is conveying. I give motivational talks in schools and some of the topics include environment sustainability,” said Ngcobo.